Σας ευχαριστούμε για την επικοινωνία με την εταιρεία μας. 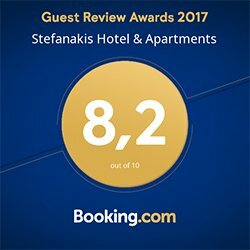 Σας ενημερώνουμε ότι θα επικοινωνήσουμε μαζί σας μόνο για τη συγκεκριμένη κράτηση που αιτηθήκατε. Δηλώνουμε ακόμα ότι τα προσωπικά σας δεδομένα δεν θα μεταβιβαστούν σε κανέναν τρίτο συνεργάτη. «What’s happened to me?» he thought. It wasn’t a dream. His room, a proper human room although a little too small, lay peacefully between its four familiar walls. A collection of textile samples lay spread out on the table – Samsa was a travelling salesman – and above it there hung a picture that he had recently cut out of an illustrated magazine and housed in a nice, gilded frame. Drops of rain could be heard hitting the pane, which made him feel quite sad. «How about if I sleep a little bit longer and forget all this nonsense», he thought, but that was something he was unable to do because he was used to sleeping on his right, and in his present state couldn’t get into that position. However hard he threw himself onto his right, he always rolled back to where he was. He must have tried it a hundred times, shut his eyes so that he wouldn’t have to look at the floundering legs, and only stopped when he began to feel a mild, dull pain there that he had never felt before. «Oh, God», he thought, «what a strenuous career it is that I’ve chosen!